Thesis topic: Role of fire and climate on vegetation dynamics in central highlands Madagascar. Tsilavo is from Madagascar and can speak Malagasy, French and English. In 2015, he received a D.E.A Diploma (equivalent to Master 2 in Biology) in Applied Palynology (study of pollen grains) from the University of Antananarivo- Madagascar. Tsilavo was exposed to many ecological topics during his undergraduate studies (2006-2012). 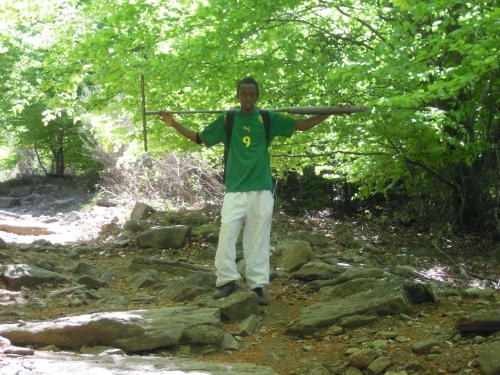 During this time, he was involved in the Phytosociological, Ethnobotanical and Vegetation survey studies in different parts of Madagascar. He then specialised in Palynology during his Masters 2 programme (from 2012 - 2015). Here he was introduced to, and became familiar with, the study of pollens and spores collected during field work using slides at the laboratory. Furthermore, his Masters 2 research also had a focus on Palaeoecology where he collected sediment cores in the different lakes of North-West Madagascar and analysed the results at the Institute of Science Evolution in Montpellier-France (ISEM). To continue in the domain of Paleoecology, Tsilavo worked as a volunteer (January-June 2016) to elaborate the database of Fynbos pollen for the Paleoecology laboratory at the PCU. He then started his MSc research at the PCU in July 2016, which was upgraded to a PhD in November 2017.